the last geek bus home: 'A' is for Avatar, 'X' is for Xbox and 'N' is for Neil: Monday's Legendary Guild! 'A' is for Avatar, 'X' is for Xbox and 'N' is for Neil: Monday's Legendary Guild! Okay, maybe 'Z' is for titles so enigmatic Google won't know what to do with it. Nevermind. If I wanted this blog to be in top 100 I would...do the opposite of what I do (apparently). What I mean is tomorrow is going to be a great day if you have an internet connection and an Xbox. Let's start with the 'A'. And the 'X'. 1) Where have you been?!? 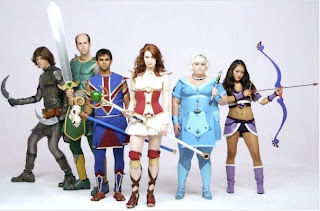 2) It's the stunning new music video by The Guild starring all the cast: Felicia Day (Codex), Sandeep Parikh (Zaboo), Amy Okuda (Tink), Jeff Lewis (Vork), Robin Thorsen (Clara) and Vincent Caso (Bladezz). And they are all in FULL AVATAR COSTUME! Season 2 of Legend of Neil has started! sucked into the world of video game, Zelda (yeah, you don't want to know how...that won't stop you from finding out, though). People lucky enough to be at the LoN panel at SD Comic Con were treated to the first 3 episodes. And the word is - OMG it's awesome! (Yes, that's 3 words. Sue me). To read a first-hand account you would do well to visit Dani Figueiredo's Comic Con reports on the Guildies Posterous blog. There are reports from other Guildies, there, too. They capture all the excitement, wonder and sheer joy of CC. She talks about the LoN panel in Part 5, but I recommend reading all of them. They are long but well worth it. Episode 8 of LoN is released tomorrow and then every 2 weeks. I can't wait to see what going to happen! And yes... LoN season 2 is pretty awesome. I can't wait to see the rest of the episodes! Should be fun! AXN is a TV channel? Wow - who says you don't learn anything from the Internet (or this blog!). I'm really looking forward to seeing the next season, too. I'm sure they have some surprises in store for us!